Home / Conventions • Signings and Cons • The Lovely Erica / The wonderful and wacky foods from the FANDOM Fantasy Food Truck at NYCC 2018! 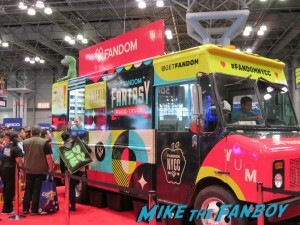 The FANDOM Fantasy Food Trucks is one of those fun and quirky things that only happens at New York Comic Con! FANDOM creates funny and tasty food inspired by some of the most popular fandoms for fans to enjoy for free! 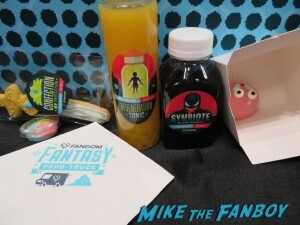 This year, the FANDOM Fantasy Food Truck celebrated its fifth year at New York Comic Con with sips and bites inspired by Venom, Voltron, She-Ra and Doctor Who. Attendees grabbed free tickets in the morning for any of the food drops during the day. 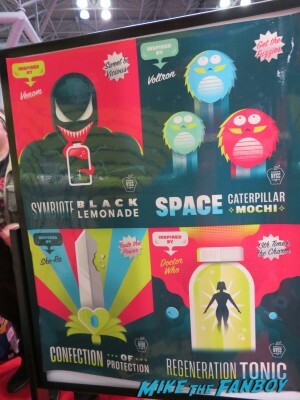 Fans could decide between black lemonade for Venom, orange juice with mango popping boba regeneration juice for Doctor Who, a space catepiller mochi for Voltron or a She-Ra sugar cookie sword with power ray frosting! Everything was quite tasty even if the She-Ra cookie didn’t need the sugary frosting dip on top of everything, but the dip was so cute! The Venom lemonade used charcoal for coloring so it was tasty, but, yeah, black ooze everywhere! Lol! The space catepiller mochi for Voltron was actually the most tasty and most adorable. 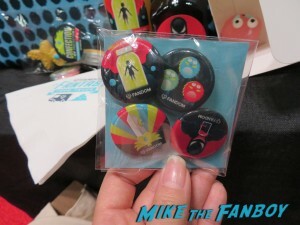 They also gave out buttons with each of the different label designs. The graphics are so cute that I appreciate this little touch! 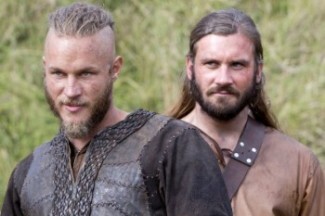 Thanks FANDOM for all the wacky and tasty fun! I can’t wait to see what next year brings! Until then, you can visit FANDOM to discover, engage with, and celebrate the world of pop culture. Whether looking for in-depth information on favorite fandoms or what’s buzzing in entertainment, FANDOM has your pop culture curiosities covered through fan-expert knowledge, original multi-platform content and discussion. FANDOM is available at fandom.com and at fans’ fingertips through the FANDOM app on iOS and Android. 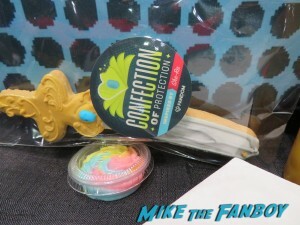 Suddenly Susan’s Preliminary SDCC 2013 Recap! With Billy Beer! Autograph Signings! Protestors! And More! 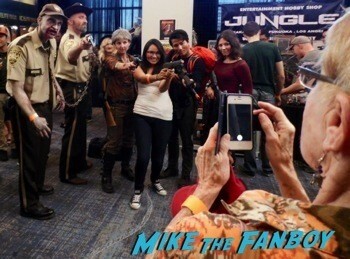 Comic Con Craziness!